A latecomer to the 2014-15 television schedule, The Librarians premiered on TNT last week – and the small amount of press leading up to it intrigued me. Not because it was on TNT, whose other entries this year – the Michael Bay-produced The Last Ship and almost unwatchable Legends (who thought putting Sean Bean opposite Ali Larter was a good idea?) – were overblown and melodramatic. But simply because the premise of The Librarians sounded just goofy enough to be appealing: an adaptation of a trilogy of made-for-television fantasy-adventure films that I'd never seen, about a character named "The Librarian" that TNT had produced between 2004 and 2008. The movies starred Noah Wyle (now on TNT's Falling Skies, which is about to air its fifth and final season) as the eponymous character, and had unapologetically pulp titles, like The Librarian: Quest for the Spear and The Librarian: Curse of the Judas Chalice. The press threw around references to Indiana Jones and Joss Whedon's Angel, but to my mind it sounded like a cross between The Middeman and SyFy's recently-departed Warehouse 13 – and that was good enough for me. The new series would star Rebecca Romijn (X-Men) as Col. Eva Baird, a counterterrorism agent assigned to watch over a new group of talented but inexperienced operatives as they negotiated a world of unseen magical and diabolical forces. And with Sleepy Hollow just going on mid-season hiatus, I had a goofy, fantasy/adventure-shaped hole in my TV-watching schedule. And so, with my expectations set reasonably low, I tuned in for The Librarians two-hour premiere last week – wondering self-consciously if my unfamiliarity with the original films would be a deficit. It wasn't. The premiere episodes seem to lay out the premise of the Librarian universe pretty simply: magic used to be everywhere but technology and industrialization has weakened its power, which currently lays largely dormant in various relics worldwide. The Library – a cathedral-ceilinged pocket universe with card catalogues, magical artifacts, and miles of subterranean library stacks – was established about 2,000 years ago to watch over the remaining bits of magic and keep it out of nefarious hands. The person in charge of that project is called the Librarian, and Flynn Carsen (Wyle) is the current office-holder. The life of a Librarian is dangerous, isolating, and often very brief. Flynn seems to have broken records by surviving his ten years, but it seems to have come at a cost, mainly to his interpersonal skills. True to the back story, Flynn takes centre-stage from the minute he appears, all manic energy and pointed Latin phrases. (It's clear Wyle has a blast playing this character – which perhaps explains why he's also on board as an executive producer of the new series) He stumbles across Eva Baird in the middle of a stand-off with some terrorists in Berlin, and casually helps her disarm a suitcase nuke while solving a millennia-old apocalypse-inducing time bomb with only a tuning fork and the stethoscope. (Maybe it was the cravat and the red flower in his lapel buttonhole, but when he delivers his teaser-closing introduction, a momentous "I am the Librarian" to a bewildered Baird, Wyle seemed to be channelling the Doctor more than any possible version of Dr. Jones) In any case, the Librarian's not one for small talk, and so that's all the time the two have – at least until a mysterious Harry Potter-style invitation to the Library appears on Baird's doorstep, and she ends up the first of many to crash Carsen's longstanding one-man show. The two-hour premiere has double-duty to perform: introduce new viewers to the world of the Librarian, and reboot the narrative for a regular weekly series – and that means giving us all the old rules just long enough for us to see them undone. The original films were more straight-ahead adventure stories – in the vein of Brendan Fraser's The Mummy movies – but lone wolf adventurers don't make for strong continuing television series. Our hero can't just defeat a plot to take over the world and recover a magical artifact or two; the story also needs a world where, at least potentially, relationships matter and characters can grow in relation to one another. To do that, our Librarian – for all his bluster – has to step aside and let the new kids play in his sandbox for a while. And so, eventually joining Baird and Carsen are a checkered group of typical unlikely heroes: Jacob Stone (Christian Kane, Leverage) a bar-fighting Oklahoma labourer who also happens to have an I.Q. of 190 and multiple degrees in Art History; Cassandra Cillian (Lindy Booth), a savant with a brain tumour who can solve complex equations on the fly ("I'm here to do science and math; and occasionally hallucinate. "; and Ezekiel Jones (played by Australian John Kim), a charming, master thief and hacker. 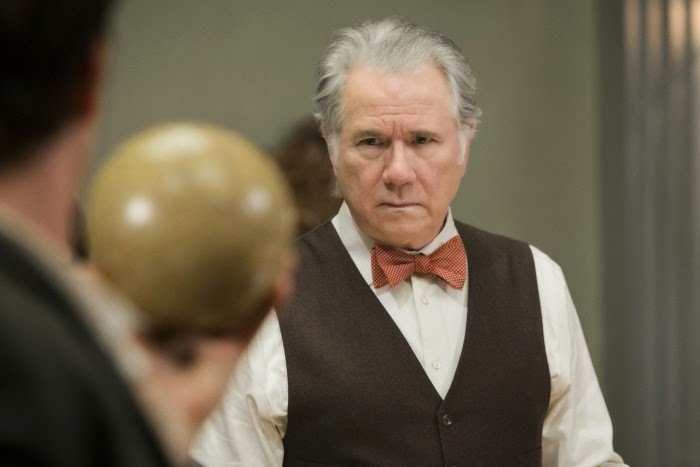 By the end of the second hour, TV veteran John Larroquette rounds out the main cast, playing Jenkins, the cranky caretaker of the section of the Library our new team ends up inhabiting (also conveniently relocating the main setting from Manhattan to Portland, Oregon, where the TNT series happens to be filmed). In the end, The Librarians is as much of a reboot of the Librarian stories than a continuation. Television legends Bob Newhart and Jane Curtin reprised their original Librarian roles just long enough to collapse themselves, and the whole trilogy context, into a wormhole. (Newhart and Curtin were both a delight to see, and for them alone, I'll be considering checking out the original films.) And though Wyle's pretty much the star of the two first episodes, his character bows out by the end of the second hour, amid some lingering sexual tension with Romijn's Col. Baird and a vague promise of returning soon. But therein lay the big issue with the opening episodes: by the end of the second hour, I found myself genuinely charmed by Flynn Carsen and his Willy Wonka-esque antics. The problem of course is those same two hours are devoted to opening a door for his character to leave – two hours in which the rest of the cast (Larroquette being the one notable exception) fade colourlessly into the background whenever Wyle is in the room, making the series' launch feel more of a backdoor pilot than a premiere in its own right. And so as the Librarian exited stage right, I honestly had no idea what the series would like without him. 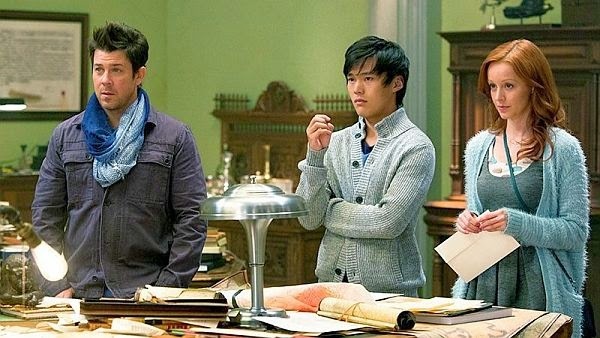 Cards on the table: The Librarians is light, escapist fare even in a world of light, escapist fare. I respect its self-conscious embracing of the ridiculous – probably never reaching Doctor Who­­ levels of killer Christmas trees or dinosaurs in the Thames, but still impressively unbound. (They've established that they've got the whole world of history, mythology, science fiction, and fantasy to play with – a world of vampires, Santa Claus, King Arthur and H.G. Wells' time machine are all possibilities.) The violence is light and unthreatening, with an almost Three Stooges quality to it – by the end of the third hour, I think Romjin had already banged bad guys' heads together like coconuts at least twice. And the soundtrack is playfully jaunty even in moments of peak tension. The show takes full advantage of the inexpensive CGI possibilities of our new century, but falls dramatically short when it comes to traditional special effects. The first hour featured an exploding helicopter effect that would have been embarrassing on The A-Team, and – even though I'm not a production values snob, and just as likely to be charmed by an enthusiastic use of limited funds as distracted by it – the Minotaur in the third episode ("The Librarians and the Horns of a Dilemma"), with his matted fur, glowing red eyes and smoke-snorting nostrils, looked like (the Colorado Rockies' mascot) Dinger on PCP and was about as threatening. The Librarians airs on Sundays at 8 P.M. ET, on TNT in the U.S. and on Space in Canada. LOVE The Librarians﻿ . It is a fun and playful show..One the whole family can enjoy! ! folks of every age can sit back and have fun and enjoy. Christian Kane bringst his own magic to The Librarians.. and to his movie 50 to 1 which is another family friendly project.. It's coming out on DVD/VOD Spring 2015 ..you will love it too! this has been the #YearOfKane.. The Librarians is a show that is long overdue. It's already made going to the Library fun again. The actors, such as Christian Kane and John Larroquette, and all the other greats make this show a special treat every Sunday night. Family oriented and magical. Can't get any better than this. I love the show. After watching the first three episodes, I think the show is getting stronger each week, I can't wait to see Bruce Campbell as Santa Claus, it should be a great show. I am also very happy that Christian Kane has come back to TV. I have totally enjoyed the 3 episodes aired so far. My expectations were high as I waited for this since April and I haven't been let down! Then again I am a Christian Kane fan who viewed and enjoyed the original movies. I prefer less shock and horror and more fun and adventure. This Kaniac will not miss an episode! All ready love this show! Not enough family shows on that rely on showing people as intelligent and funny. I am tired of all the shows relying on dumb characters to get the laughs. This is one that brings back the good comedy that is hard to do well and shines with it. Add to that the fact it has enough to keep adults and children entertained and you have a winner. You have actors like Christian Kane that can make you laugh out loud or tug at your heart enough to make you cry with just a look. I will be watching this show for as long as they make it.